Shoulder joint is a topic that I’m truly, madly, deeply passionate about. This love relationship started when I realized I needed to learn to stabilize and strengthen my own shoulders that were so overstretched from many years of rhythmic gymnastics when I was younger. All the overstretching had left my shoulder joints so hypermobile that the range of motion would make contortionists envious. This of course came together with a lack of stability, proprioception and awareness in that area. Long story short, as I’ve struggled with my own shoulder stability, I’ve been fortunate enough to meet amazing specialists who have helped me gain more understanding on this topic, and I now want to share these stabilizing techniques with others through my yoga teaching, and hope to create a ripple effect for a new paradigm shift in yoga teaching. One of the common shoulder cues in yoga (you won’t hear this at Ihana Yoga) is to pull the shoulders down to stabilize them. I was taught this way, tried to practice this way for years and even taught it. It was only when I started understanding the anatomy of the shoulder joint complex that I gave up this technique myself and also stopped cueing it. When interviewing leading shoulder experts about yoga cueing, they all said that the worst cue you can give is to pull the shoulders down. To understand why this cue is useless, we first have to understand the basic anatomy of the shoulder joint, as well as its mechanics and natural movements. Shoulder joint complex has definitely earned its name – it is complex. Not only is it the most mobile joint in the body that can be freely moved to all directions, but also it requires 4 joints to work in correct succession to create natural arm movements. The shoulder girdle (collarbone and shoulder blade) just like the pelvic girdle connects the limbs to the trunk with a ball-and-socket joint. Unlike the hip joints that often need mobilizing, the shoulder joints are inherently mobile and need stabilizing. As the socket only fits in a third of the humeral head, it needs muscular control to stabilize. When the arms are lifted over the head, such as in sun salutations or downward facing dog, a complex movement pattern called scapulohumeral-thoracic rhythm has to take place. 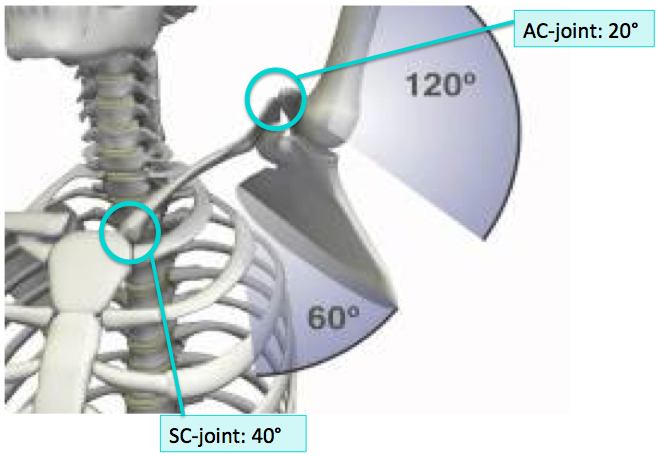 First the arm lifts in the GH-joint, then the collarbone lifts and rotates at the SC-joint, then the AC-joint moves to elevate and finally to upwardly rotate the scapula. If that sounded like foreign language (which anatomical terminology is) not to worry. One thing to remember is the word rhythm. Scapulohumeral-thoracic rhythm suggests a correct succession of movements between the arm, shoulder girdle and the ribcage. 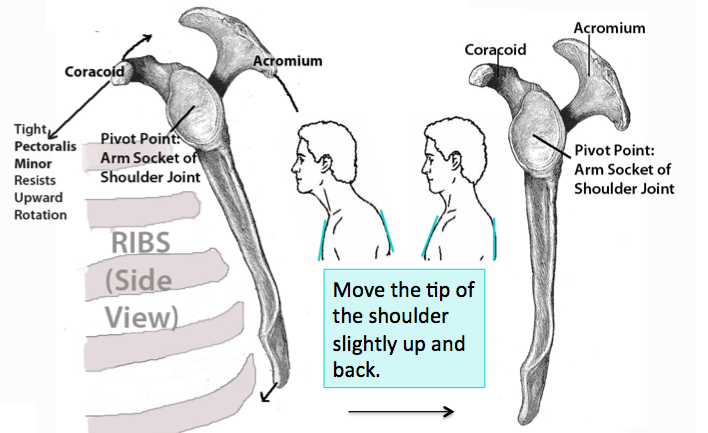 The movement of lifting the arms up therefore needs a combination of scapula and arm movement. This complex movement requires a combination of rotation (spinning) and translation (gliding) to create rolling joint movements. To keep the humeral head connected to its socket, it spins and glides to opposite directions. Trying to keep the shoulders pulled down would also fixate the socket into an unnatural position. When we lose the approximately 60-degree angle of scapula upward rotation and elevation, the humeral head needs to glide excessively to stay in the socket. Shoulder studies show a correlation between instability and excessive translation. This compromised movement pattern assumes that the humeral head pivots around one axis located at the geographical centre point of the humeral head at all times, whereas early shoulder studies (Fisher et al in 1977) showed that the axis migrates during abduction; this migration is called instantaneous axis of rotation. When this natural movement is compromised the brain attempts to protect the joint with muscular inhibition to limit movement, which gives us yet another reason for increased instability due to lack of dynamic support provided by the muscles. Therefore, by trying to stabilise the scapula by fixating it down can lead to muscular imbalances and instability instead. 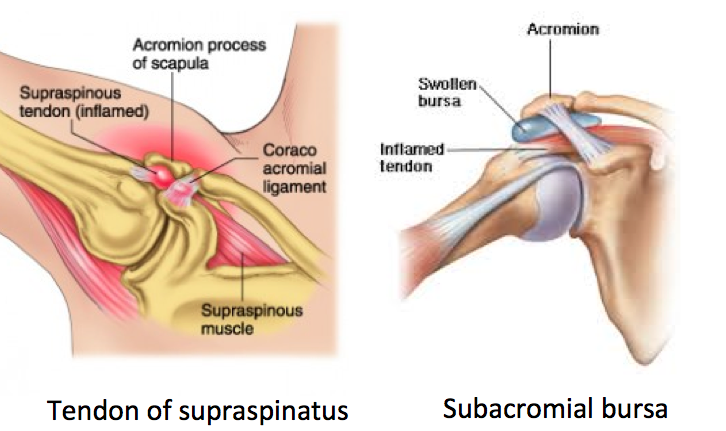 The pain and injury that can follow is called the impingement syndrome, where the supraspinatus tendon or the subacromial bursa is compressed between the scapula and arm, when the acromion doesn’t lift up and out of the way during an arm lift. Thank you for reading this far. 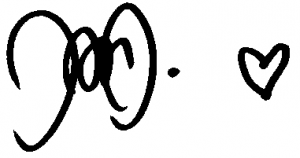 I hope that at least this humble little blog post made you question the cue ‘pull the shoulders down’ and hopefully gave you a spark of inspiration to try something different. So what to do instead? Before you lift the arms, make sure you stand in a tall upright posture, and if your shoulders have a tendency to droop forward and down, do the opposite – lift them slightly up and back. You’ll feel the shoulder blades setting flat on the back, which will allow a natural range of scapula movement. Then simply lift the arms without thinking about the shoulder blades and they should naturally move up the way they’re designed to move. Enjoy the new ease in your shoulder movements!